Electronics have revolutionized the world. We use a number of high-tech devices multiple times a day. And the individuals with the skills needed to build the electronic components that drive these devices are in demand. For whatever reason, Americans seem to love electronic gadgets. We can't get enough of the iPods, digital cameras, video games, and stereo equipment that line the walls of our favorite electronics stores. The most amazing part is, we have only just begun to scratch the surface. Who knows what the next big invention will be? The iPod, for example, would have been unimaginable just 10 years ago. Maybe you already have a great idea for a new product. 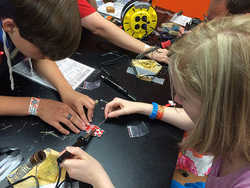 Or perhaps you simply like tinkering with electronics to see how they work and how they can be improved. In either event, you should seriously consider attending one of the many electronic technology programs out there. What Will Electronic Programs Teach Me? Quite simply, you'll master all of the in's and out's of modern electronic equipment. This will include circuitry, basic physics, wiring, programming, hardware, manufacturing, and many other related disciplines. How Will I Apply This Training? There are many different avenues you can pursue after you have mastered electronic . Some people go into the business/manufacturing side of things and help build new gadgets for consumers around the world. Others decide to join the repair/service side of the industry so as to help consumers troubleshoot problems and fix their existing electronic components. And still others go into research to look for more efficient and cheaper ways to produce electronic gadgets. As you can see, if you can navigate your way through the intricate circuitry that comes with most electronics, a world of opportunity awaits you. There are so many different paths you can take after your certification.